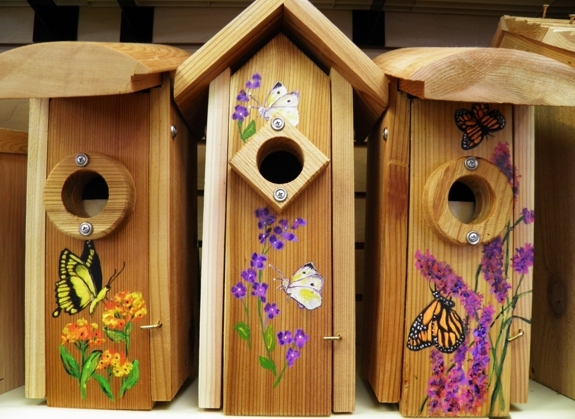 Nesting season will be here before you know it, and Wild Birds Unlimited East Lansing just brought in the most adorable Michigan-made, hand-painted bird houses that are all properly designed! As soon as the ice melts and the days get longer birds get excited. Nesting season can vary depending on the species of bird, the weather conditions, food availability, and many other variables. Some larger birds like owls, hawks, and eagles may begin courting in December and nest in January and February. Other birds that winter in Michigan may begin to sing and scout for good nesting territories as early as late January. A reliable source of food like bird feeders may contribute to a bird deciding to nest early in your yard. Black-capped Chickadees and Eastern Bluebirds are probably already scouting out bird houses for their first clutch. Starlings and sparrow have also been scouting. Northern Cardinals and American Robins usually nest anytime from March to August. In some areas the Mourning Doves nest almost year round because they feed their young “crop milk”. And soon we'll get calls about birds making their nests in holiday wreaths. Anyone who places hanging plants on a covered porch in the spring or leaves a holiday wreath hanging on the door may find that by April a female House Finch has begun to build a nest in it. If a bird starts to nest and a cold front moves in, they may suspend their nest building activities for a couple weeks and then continue when the weather is more favorable. This may happen especially with inexperienced and excited first year nesters. Research has found that the basics in nest construction are primarily instinctive, but birds’ nesting skills improve through trial and error. Other birds that migrate in to nest in Michigan usually begin nesting in May. Birds like House Wrens, Tree Swallows, Baltimore Orioles, and Ruby-throated Hummingbirds come in hungry but get right down to business and begin nesting as soon as possible. To help the birds you can keep your feeders clean and full of fresh seed. Stressed birds are susceptible to disease. 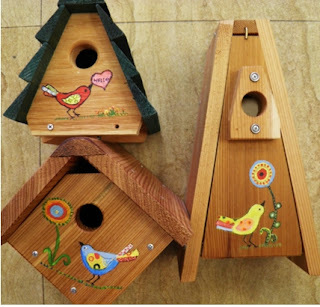 Make sure to put out nesting material and have bird houses are ready for occupancy too.